Um, knowing that it is possible to google people, places and things and find out if something possibly unflattering has been said about you, let me write this post in code. It was super, super surreal. It was mildly awkward at the start and grew more and more so as the evening went on. She would say things that just didn’t make any sense, and …. I just can’t explain it. I don’t want to say any details but there was the shining moment where it went from “This is sooo painful” to “This is going to be a great story”. Except I can’t tell it in detail because of the google guilt. This text exchange to Lloyd occurred right before that moment. The part that you can’t read is where I am telling him I think she’s tipsy, and he has responded that it would be rude of me not to join her. This was in no way Behth’s fault. In fact, it took her by surprise as well. She walked around near the end with an expression that conveyed the hilarity of it all and quietly expressed her sympathy. I don’t think she has anything to apologize for! I do feel badly for the Putterware lady, though. I hope it was just an off night. It is most refreshing in this day of YouTube and blogsites to see such personal restraint and charitable discretion exercised, bravo Lauren! However, I wish you could’ve videotaped it just the same!! At first I thought your picture was of your own phone. I thought to myself: Lauren has an iPhone?!? 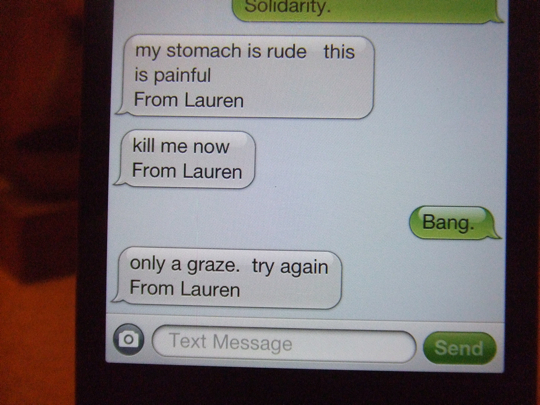 Then I noticed your texts all said: “From Lauren”. I am going to make the transformation to an iPhone user soon. I’m just waiting for them to be in stock again. I’m a little scared though. I know that once you make the change, there is no going back. What will I be like? Will I remember my old non-iPhone friends? My local Best Buy has my iPhone waiting for me to pick it up. Do you want it? It’s a black 32 gig for VZW. I got impatient and took the white counterpart right after the release. Don’t worry -- you’ll remember your old non-iPhone friends. I still do. I did, however, try to swipe the screen of my kindle. It’s not a touch screen. Oops. P.S. I have an iPhone!!! SQUEE!!! You’ll remember them, but you will text them less often, because texting your iPhone friends will be free. I got one today……my old phone needs someone to put it out of it’s misery. I’m so sorry I missed it. Do it again Beth, do it again! That was…a unique experiece, I’ll give her that. Wow. The guilt of laughing was overpowered by the pure bizzare-ness of the situation. By the time she left, she seemed a lot better. I guess. Excellent retelling…laughing again just reading about it. I think it was a test for Dehborah to see if she could ignore the outrageousness and politely pretend that everything was normal. She failed. It was hilarious. And wrong. On so many levels. She had to be drunk. There is simply no other explanation. But, hey! I get some free stuff! I laughed out loud when I saw you all using your code names. I did too!! HAHAHAHA! This whole thing is HILARIOUS!! Now…I want a code name, I want a code name!! Well, the obvious choice is Pheggy. Which is phunny. Are you sure she wasn’t having a trans-ischemic attack: a mini-stroke? People recently thought my partner was drunk and he wasn’t. Instead he WAS having a series of little strokes in the capilliaries of his left frontal lobe. Yikes! Is he alright now? That sounds very intense. We’re pretty sure it was the alcohol. Behth said she arrived at the event without having had dinner and drank her margarita on an empty stomach. Yes, he’s okay, thanks for asking, but he has to take meds and he did suffer some memory loss -- he took numbers of pairs of trousers to various drycleaners that week (part of the series of mini-strokes we think he had) and he can’t remember which ones. He still hasn’t got all of them back. His speech was slurred for a while, but that’s subsided. Poor woman, she must have been so embarrassed. Perhaps she didn’t realise the extent to which the drink would have an effect.